The cell. 3. Cell membrane. Carbohydrates. Atlas of plant and animal histology. Membrane carbohydrates are chemically bound to glycolipids and glycoproteins. However, some membrane carbohydrates are part of proteoglycans that insert their amino acid chain among the lipid fatty acids. Although some carbohydrates can be found associated to intracellular membranes, most of them are located in the outer monolayer of the plasma membrane, facing the extracellular space (Figure 1). The synthesis of membrane carbohydrates starts in the endoplasmic reticulum, but it is in the Golgi complex where they are modified and grow by adding many new monomers to form complex carbohydrate molecules. Figure 1. Carbohydrates in the plasma membrane. Glycolipids are mainly sphingolipids with different carbohydrate compositions. Some proteoglycans have part of their amino acid sequence inserted among the lipid fatty acid chains. Most of the carbohydrates are chemically linked to proteins, known as glycoproteins, either by O-linked glycosylation (via serine amino acid) or by N-linked glycosylation (via asparagine amino acid). (Modified from Fuster and Esko, 2005). 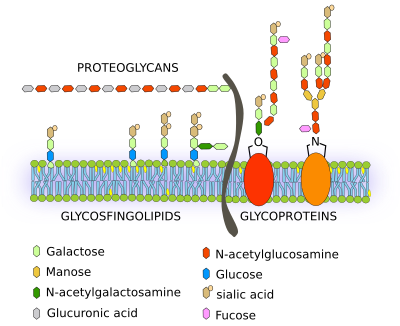 Three types of glycolipids are found in membranes: glycosphingolipids, which are the most abundant in the animal cells, glycoglycerolipids, and glycophosphatidylinositol. Glycoglycerolipids are more frequent in the plasma membrane of plant cells. However, most of the membrane carbohydrates are found linked to proteins, known as glycoproteins. Nearly all the membrane proteins have carbohydrates, but only 5 % of lipids are glycolipids. Carbohydrates of the plasma membrane as a whole are referred as glycocalyx. In some cell types, glycocalyx is so developed that can be observed with the electron microscope. For example, in erythrocytes, the glycocalyx can be extended more than 1 µm in length from the plasma surface. In this way, the cell is covered by a coat of carbohydrates that can be up 2 to 10 % of the membrane weight. The glycocalyx development depends on the cell type. Membrane carbohydrates perform two main functions: participate in cell recognition and adhesion, either cell-cell signalling or cell-pathogen interactions, and they have a structural role as physical barrier. For instance, blood groups are determined by cell surface carbohydrates of erythrocytes, and they also have the ability to trigger immunological responses. After an infection, endothelial cells near the injured tissue expose a type of proteins, known as selectins, in their plasma membranes. They recognize and bind carbohydrates of the plasma membrane of lymphocytes that go through the bloodstream. In this way, lymphocytes get attached to the blood vessel walls, can cross the endothelium and move to the infection focus. Carbohydrates as recognition molecules are also important during embryonic development. Carbohydrates of the plasma membrane are major recognition and attaching sites for pathogens during infection. Virus, such as the influenza virus, pathogenic E. coli bacteria, and some protozoa need to be attached to the cell surface before entering the cell, otherwise they will be swept by the cleaning mechanisms of the body. These pathogens have proteins, known as lectins, that bind to specific carbohydrates of particular cells. Thus, the type of cell to be infected depends on the carbohydrates they show in the plasma membrane. Vertebrates, invertebrates and protozoa bear different set of carbohydrates in their cells. Curiously, some pathogens are able to "dress" superficial carbohydrates similar to those of the host cells. In this way, they cannot be detected. There are differences in the carbohydrate composition of cells of vertebrate, invertebrate and protozoa. Fuster MM, Esko JD . The sweet and sour of cancer: glycans as novel therapeutic targets. Nature reviews cancer. 2005. 5(7):526-542.